Photo: Mosen Eteshami, General Manager of Mullinax Ford. Last week marked the end of an era in Vero Beach, where, for the first time since 1976, the Ford dealership conducted business under a name other than Velde. The Apopka-based Mullinax Automotive Group finalized the purchase of Velde Ford on March 26 and immediately rebranded the dealership as Mullinax Ford of Vero Beach. The local Ford dealership is now one of five owned and operated in Florida by Mullinax Ford, the state’s largest Ford retailer, which was among the pioneers of the upfront, no-haggle pricing philosophy that began in the mid-1970s and has become popular throughout the automobile-sales industry. “We’ve been in this industry for many years, and I know our philosophy can provide the community with a dealer experience they haven’t had before,” said Jerry Mullinax, owner of the Mullinax group, which has been doing business in Florida since 1970. Mullinax said he has retained about 90 percent of the Velde staff, most of them longtime employees. Those employees made the decision to sell the dealership difficult for Patty Velde, who had served as Velde Ford’s president since her husband, Jeff, died in September 2012. Velde’s father-in-law, Lynn, who had co-owned three dealerships in Illinois, moved to Vero Beach in 1976 and bought what was then Arnold Ford, near U.S. 1 and 12th Street. In the late 1990s, Velde renovated the former Walmart store at the intersection of U.S. 1 and Indian River Boulevard and moved the dealership to that location, converting the building into an 82,000-square-foot facility that contains an acre-sized showroom, service area with 33 bays, 10,000-square-foot body shop, parts department and offices. Velde’s father-in-law died in 2000. Evans said Velde, who did not want to be interviewed for this story, decided in 2018 to put the dealership on the market and attracted “several suitors,” including Mullinax, which had initially expressed interest a year earlier. Potential buyers were told, “Make us an offer we can’t refuse.” Apparently, Mullinax did, though Evans would not divulge the purchase price. He said serious negotiations began in November. In January, Mullinax posted a public notice of its intent to register “Mullinax Ford of Vero Beach” with the Florida Division of Corporations and do business under that name. Less than three months later, employees at Vero Beach’s Ford dealership were wearing “Mullinax” shirts. Mullinax Ford’s other Florida dealerships are located in Apopka, Kissimmee, New Smyrna Beach and West Palm Beach. The company also has dealerships in Mobile, Ala., and Olympia, Wash.
Eteshami said Mullinax Ford will invest a significant amount of money in its Vero Beach dealership, which will undergo renovations and aesthetic improvements, and the company expects to dramatically increase sales. He said the Velde-owned dealership was underperforming. 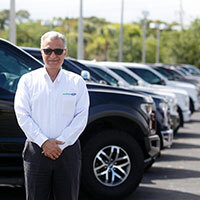 “I’ve done some market research, and they were way below Ford’s expectations, which are based on demographics,” said Eteshami, who was the sales manager at Mullinax’s West Palm Beach dealership before being promoted. “There’s a lot of room for improvement.